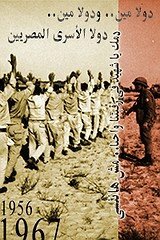 Egyptian Chronicles: What the hell happening in Alexandria ? 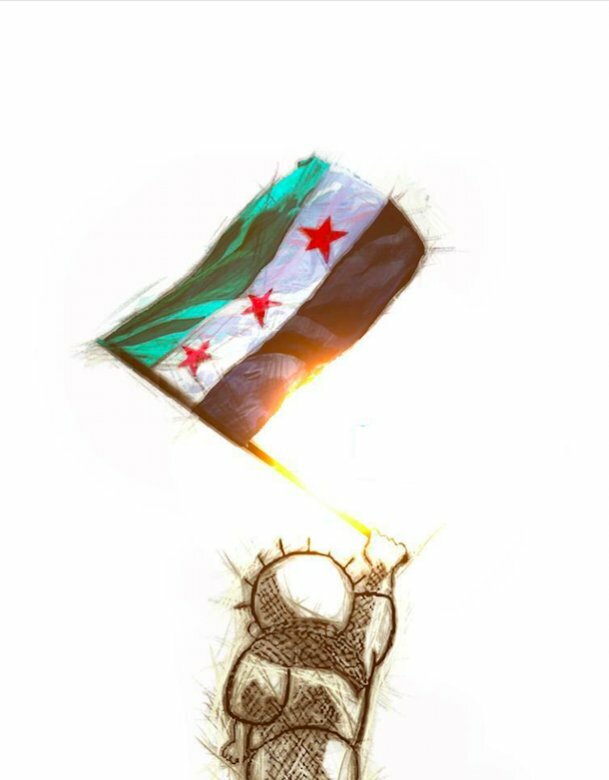 "Updated"
I know I have not been blogging actively as I am currently torn between work, flu and cold and following the Jamal Khashoggi’s sad saga and its developments. I find extreme angry and depressed. Nevertheless here I am trying to blog what annoys me and what cheers me nowadays in my country Egypt. From a couple of days ago, I read a news that bothered me a lot. Some local Facebook news page in Alexandria spoke about how people spotted the army’s military police inside the perimeter of the historical and famous Aziza Fahmy palace. The page showed photos for the army’s vehicles outside the palace claiming that its fences were being demolished. It was said that the Armed Forces Engineering authority was allegedly building a huge hotel complex on the land of the palace. 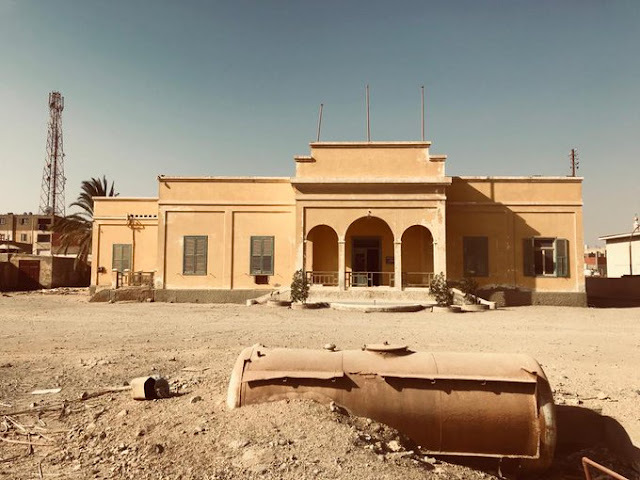 Some concerned citizens include myself fear that the palace which was built in 1905 for Egyptian socialite Aziza Fahmy of the Fahmy clan is going to be demolished. All the surviving palaces of Fahmy clan "owned by ladies" are pieces of arts in their own way. 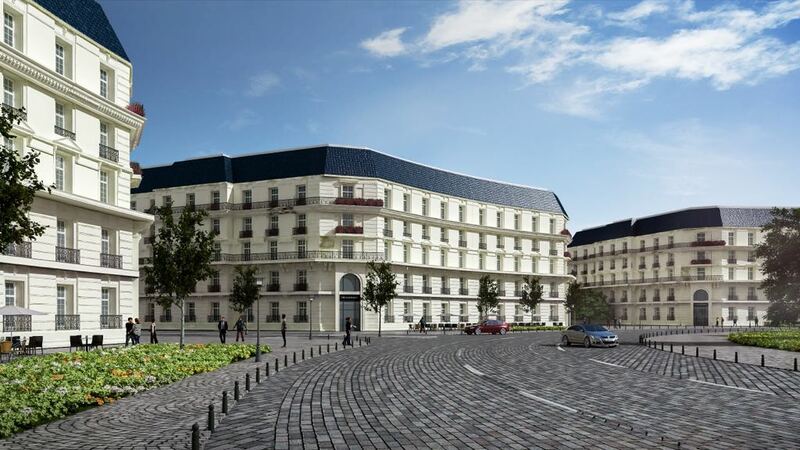 He even posted an alleged design for that hotel. 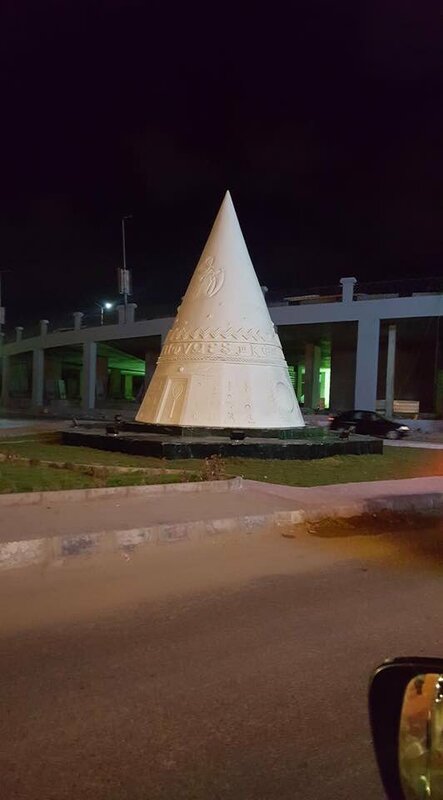 According to architect Hussein Mahran , this alleged design is not the final nor the official one. He also added in a comment on Twitter that the design and drafting technique were very outdated and there were several proposals for that plot since the 1990s. Now judging from that photo I took in May 2016, I do not know how the army’s engineering corps will build that alleged hotel considering the space around the palace is not that big !? It is not that big !! Yes, it is the third biggest historical palace in Alexandria if you take into consideration its garden but still, it is not that big to host such hotel as it appears in that alleged design. Also, what is in the future for that free public beach in front of the palace and its garden? I do not know why the government does not use its brain and turns that Aziza Fahmy’s Palace into a national museum like her sister’s palace which is a successful museum hosting the Egyptian Royal Family’s jewelry. We got hundreds of thousands of ancient Egyptian artifacts in the warehouses. We can host a collection of them in that palace and turn it into a cultural venue. 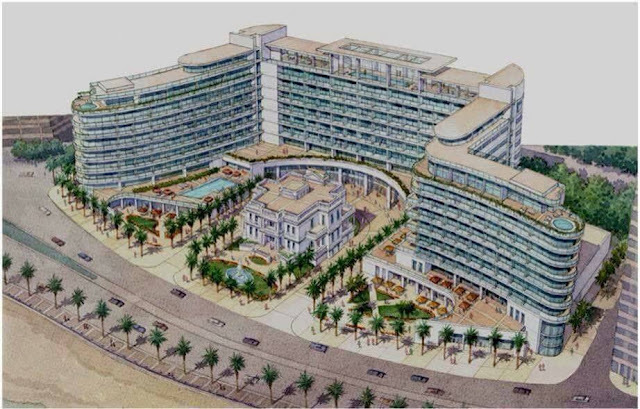 It seems that the Armed Forces Engineering Authority has replaced The Egyptian General Co. for Tourism&Hotel “EGOTH” in the battle with the 40 heirs of the palace who had a 50-years-old fight with the state over the 15 thousand m2 property “The Palace is only 650 m2 ” in November 2017 according to EGOTH CEO. 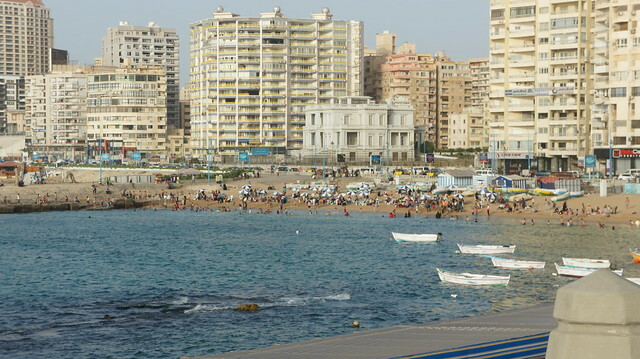 The Engineering authority has already got several development projects in Alex. 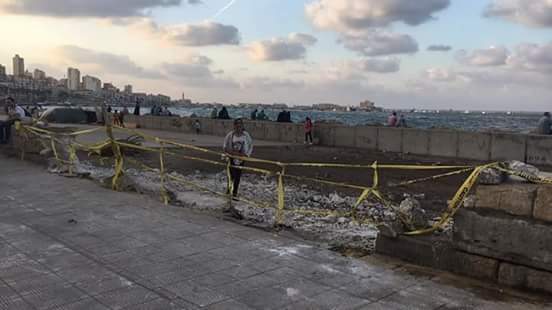 Moving to another disturbing news, current Alexandria governorate officials have demolished part the old Alexandria Corniche in Al-Mansheya to build parking lot !! The old corniche after it was demolished !! 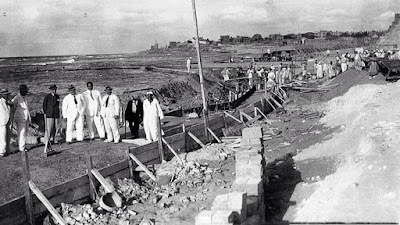 According to my humble historical info, that specific part of corniche was built during the rule of Abbas Helmi II “reign from 1892-1921” and the rocks used to build it were imported from Europe. In the end, I like to share with you that strange sculpture installed in Alexandria last week. Is that an upside-down cone or native American tent aka tipi !! 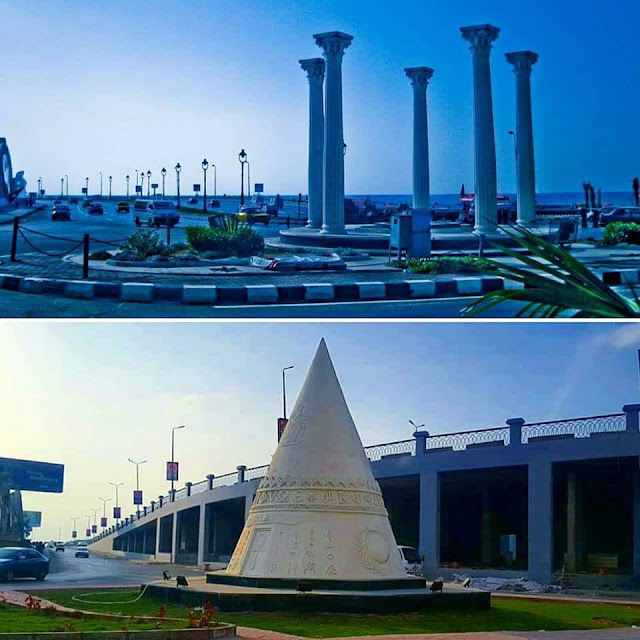 This Alexandrian tipi is installed in famous Sidi Gabr quarter and it turned out that it is replacing beautiful greco-roman columns. The whole scene actually changed as now there is some bridge that blocked the sea view and it is seriously unfair and ugly. What the hell is happening in Alexandria for the love of God !! I do not understand why the government and the governorate insist on erasing the beauty of old Alexandria for real. Ironically, the government and the New Urban Communities authority announced that New Alamein City would have its own its own-450 feddans Latin Quarter, cloned from the original Latin Quarter in Alexandria !! 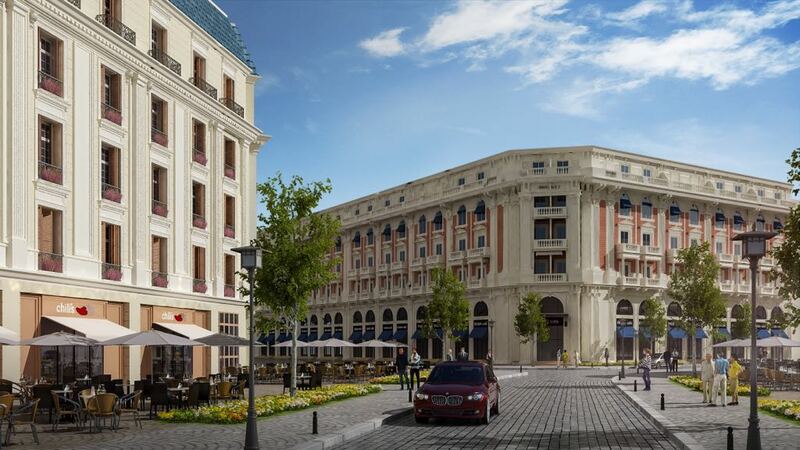 Six Egyptian Construction Companies are participating in building that quarter in the new city on the Mediterranean. So if you like that old European style in Alexandria that much, why do you erase it in Alexandria in that way? I'm visiting Luxor now, reading your blog. We once stayed next door to a Palace, the one on the coast with the Light House, at the end. 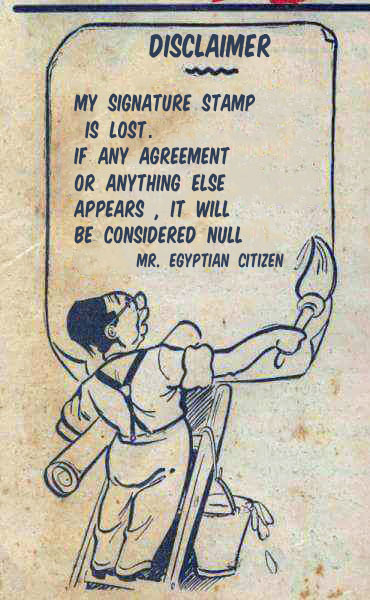 I hope you enjoyed your stay in Luxor. I will be visiting Alex next month...so sad fir the news about reshaping Alex and diffenatly disappointed but will try to find away enjoy.. It's still Alex..